As someone who doesn’t eat eggs often, I sometimes find going out to breakfast or brunch to be difficult. When I was younger, I used to order all the sides. 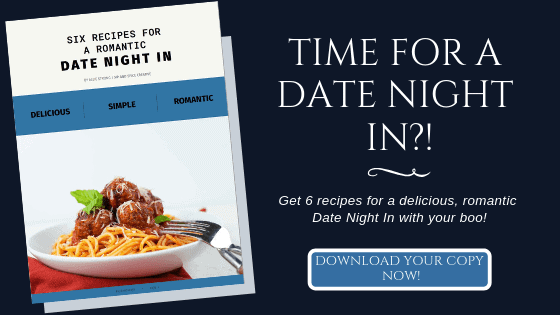 Sometimes I’m still totally down for that, sometimes I ask for an omelette without the eggs over hashbrowns (which always gets a laugh – or a raised eyebrow – but it’s really just a veggie-packed bacon or ham stirfry on potatoes! ), but most times, I just order a BLT. And if things are in my favor, a Roast Turkey BLT. Whenever Luke cooks bacon for a weekend bacon-egg-and-cheese, he always cooks me a piece or two. But a few weekends a year when I’m lucky enough to have some leftover sliced tomato lying around, I ask him to make me a couple more slices so that I can make a stacked roast turkey BLT. But ya know what makes this Roast Turkey BLT all the more incredible?! It’s the herbed mayo, baby! Now you KNOW how much I love a good condiment. Lord knows I preach about aiolis and sauces all the time. 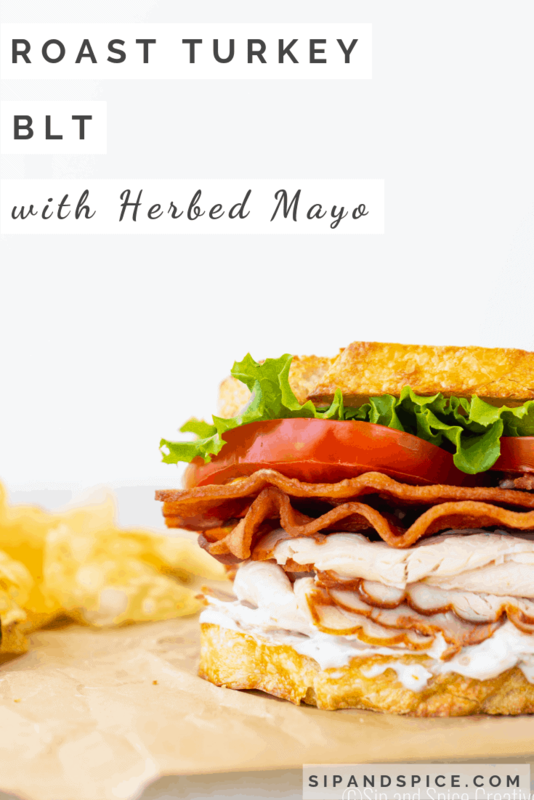 But this herbed mayo takes all over 15 seconds to make and takes your Roast Turkey BLT from good to holy-cow-this-is-amazing. 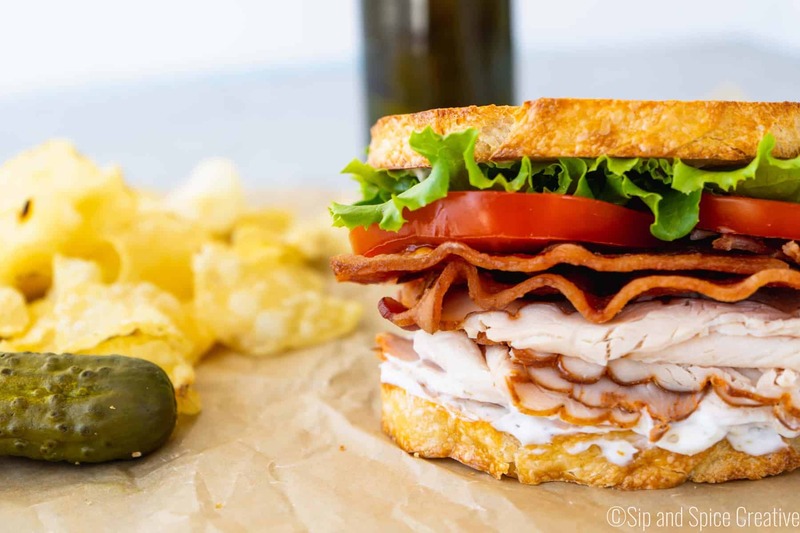 The simple combo of mayo, Italian seasoning, garlic, salt and pepper will make your Roast Turkey BLT sing. 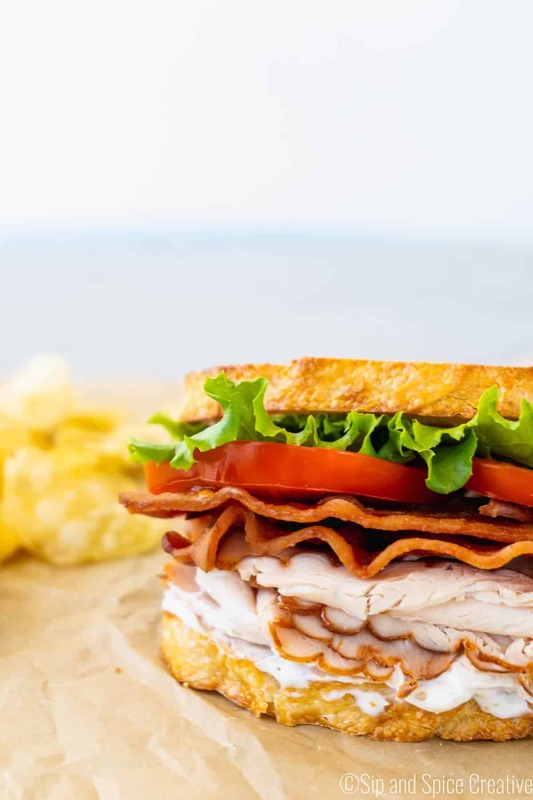 With the simplicity of a BLT, bacon, lettuce, tomato, and in this case, roast turkey, the quality of the ingredients are huge. I love Farmer’s and Cook’s Fireside Roast Turkey because it’s all the good stuff, humanely raised with no antibiotics, vegetarian-fed, no nitrites or hormones, but the reason it’s really special is because it’s single cut. What does that mean you ask? Well, ya know what a turkey breast looks like when you cook it on Thanksgiving? That’s what Farmer’s and Cook’s meats actually look (and taste!) like then they’re sliced. They aren’t shiny and plastic-y looking like most deli meats. And the Fireside Roast Turkey specifically has a powerful fire-roasted sort of flavor with a hint of smokiness and spice. It’s the most un-deli meat deli meat I’ve ever tried. It’s available all over New England. I pick mine up at Market Basket in Waltham, but if you see it in your deli case, grab some immediately. It’s a bit more expensive than traditional deli meat, but it’s really a whole different product! So yummy. Toast the bread, slice the tomato and clean the lettuce. In a small saute pan, cook the bacon for 4-5 minutes per side, then drain on a paper towel. In a small bowl, combine the mayo, Italian seasoning, salt, pepper and garlic powder and mix together. 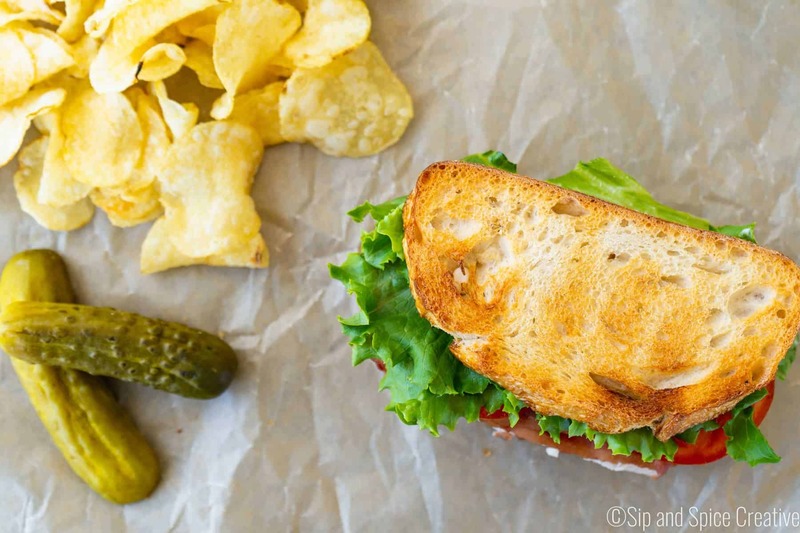 To build the BLTs, spread the mayo on the bottom slice of bread and top with 2 slices of turkey, 2 slices of bacon, 2 slices of tomato, 2 leaves of lettuce and top with the other piece of toast.